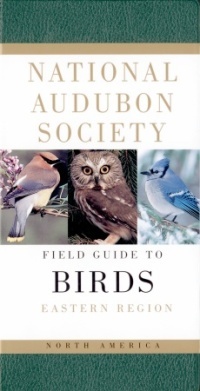 National Audubon Society Field Guide to North American Birds - Eastern Region, by John Bull and John Farrand, Jr. . In 1977 this guide broke new ground by using color photographs for field identification. (Photos vs. illustrations is a matter of taste for the individual birder.) This revised 1994 edition has 646 photos of excellent quality. Text & range maps for the 508 species are in a different section than the photos, which makes the guide a bit harder to use in the field. The photos are grouped by plumage color. 800 pp, 4 1/8” x 7 ½”.